The authors developed and tested an approach to identifying priority areas for conservation that are less impacted by human activities than other areas. 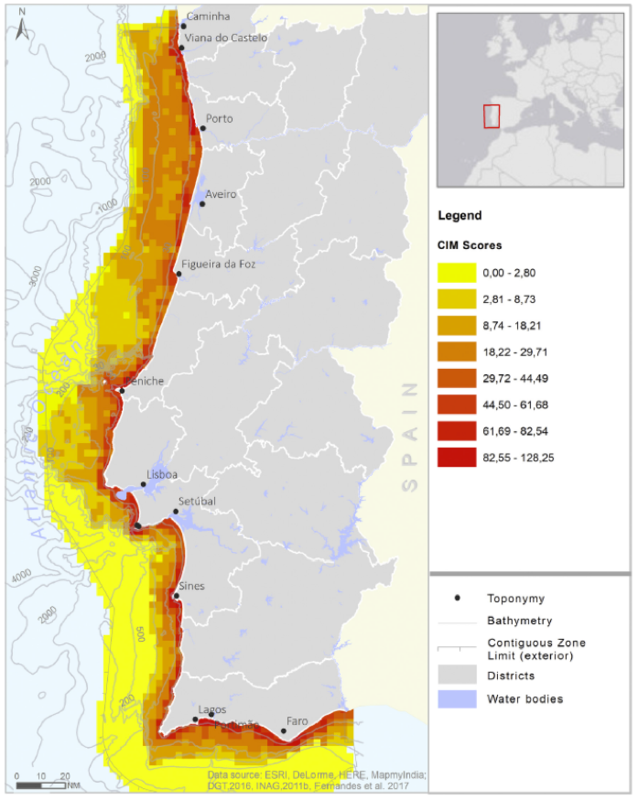 The approach combined Marxan and cumulative impact decision support tools to analyse areas for conservation initiatives in marine waters off of mainland Portugal. The results show the value of considering human activities and uses in conservation planning and development of management alternatives, as well as how ecological goals can contribute to MSP in Portugal as part of applying an ecosystem-based approach. The results provide new inputs for allocating space as part of MSP and also for dedicating MPAs as part of MSFD measures. What is one potential model for identifying priority conservation areas at sea that face less human impacts? How can spatial decision support tools help link the Marine Strategy Framework Directive and the Maritime Spatial Planning Directive? The study was conducted in the marine waters offshore of mainland Portugal (i.e. Portuguese mainland subdivision) to support development of the Portuguese maritime spatial plan. Under the Portuguese national MSP law, two sets of MSP instruments are to be developed: the Situation Plan (SP) and the Allocation Plan (AP). 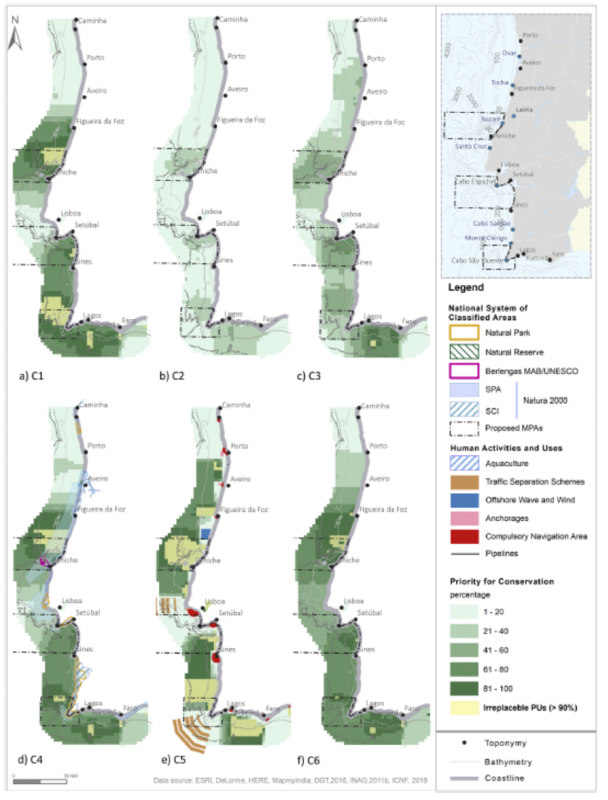 The study was developed with the intention to provide information for the authorities developing the Portuguese SP when assigning space to uses, in order to avoid less impacted ecological areas. Based on the analysis performed, the study evaluated the results in comparison with new proposed MPAs under the scope of the MSFD. 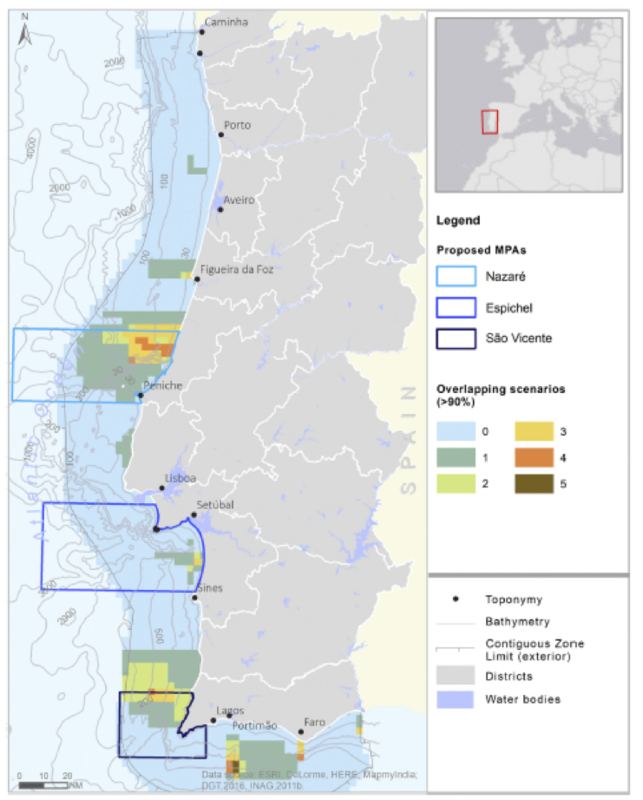 The main goal of the study was to provide information to the MSP process in Portugal, specifically regarding priority areas for conservation that are less impacted by human activities than other areas. This was done by developing a tool to support the decision-making process of distributing activities and uses in space. The authors used Marxan, a decision support tool for designing a networks of areas that satisfy a number of ecological, social and economic goals. Marxan can be used to develop scenarios for meeting conservation needs, and propose alternatives to existing protected area networks. To populate Marxan, the authors compiled information on the spatial distribution of species and habitats designated for conservation in accordance with the Natura 2000 network. Certain species and habitats were selected as a priority due to their Natura 2000 status, or based on other criteria highlighting the importance of the species or habitat (e.g. IUCN Red List of Threatened Species – please see article for other sources). The iterative algorithm behind Marxan is intended to identify an optimal spatial solution for biodiversity objectives (i.e. targets) while minimizing the areas selected with poor ecological condition (i.e. costs). The Cumulative human Impacts Model (CIM) on the marine environment (developed in Fernandes et al 2017– see figure 1) was used as a surrogate for ecosystem condition. For example, in Scenario 5, planning units where aquaculture, shipping lanes, offshore wind, wave energy or pipelines are present were excluded from inclusion in the reserve system. Each grid cell used in the Marxan analysis was considered a planning unit. The main outputs of the analysis, conducted using GIS software, were used to develop summed solution (SS) maps displaying how many times a planning unit was selected as the final solution from the multiple iterations used in the Marxan algorithm. Planning units that contained the highest priority for conservation (e.g. target values over 90%) were designated as “Irreplaceable.” These planning units were then extracted and overlapped with each other to identify key areas emerging from the different scenarios. Best Solution outputs were also analysed regarding achievement of targets, missing values and costs in each scenario. Spatial results of the summed solutions for each scenario are shown in Figure 3. Of the Best Solution outputs, Scenario 5, where planning units with human activities were excluded, had the lowest achievement of targets and the highest Best Solution score. The comparison of results across scenarios shows four areas where higher conservation priorities stand out. By overlapping the “Irreplacable” PUs, a hot spot analysis was developed to show the locations consistently selected across all scenarios (Figure 4). The combined results show four main areas with higher percentages for selection, even in low targets scenarios. 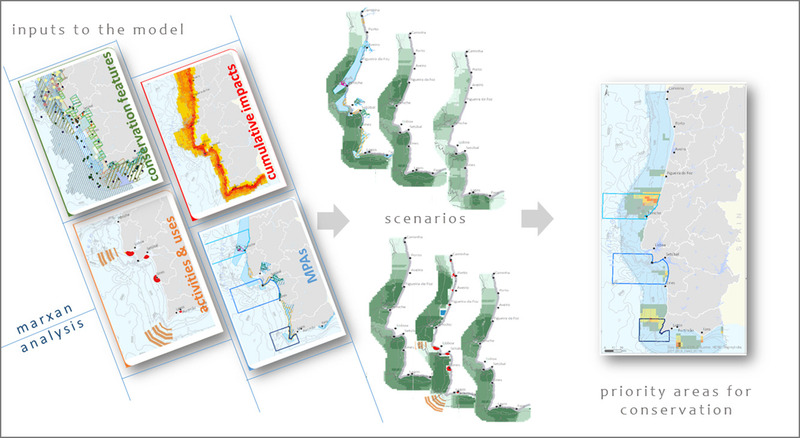 The methodology therefore demonstrates how to combine conservation objectives and cumulative impacts to support the decision-making process when allocating space to uses and activities. The overlapping methodology (Figure 4) in particular highlights where higher priority classes are located, and allows spatial analysis of all scenarios in a way that is easy to explain to stakeholders, planners and decision makers. The results indicated where important ecological values are less impacted and provides input for determining management alternatives, in particular those to be made as part of MSP and determining a programme of measures (e.g. MPAs) for MSFD implementation. The authors acknowledge the need for further improvement in cumulative impacts assessment to account for seasonality of activities and uses, among other factors, as well as increasing certainty of ecologic and human activities information used in the model. Nevertheless, the outputs from this model can still be used to support the planning process to design management alternatives while at the same time incorporating the national strategy conservation priorities. Marxan software is designed for application in various contexts; thus, the underlying software can be used in other contexts given that adequate data is available in the proper formats. The CIM, previously developed for the Portuguese context, would need to be adapted to a different context in order to be used as a surrogate for ecological condition, input as “costs” in Marxan.